New word from the Metropolitan Transportation Commission is all youth Clipper card users can now obtain their AC Transit 31-day passes without the need to have a specialized Clipper card with their photo on it (only issued by AC Transit). This also allows all youth card applicants to be able to apply through any transit agency's ticket office, email, or fax. The Commission stated the AC Transit Board of Directors eliminated the photo on card requirement because it was a hindrance to all youth in the transit service area to get a specialized card to be eligible to purchase the 31-day pass. Before the change in this policy, any youth needing to purchase a 31-day pass for AC Transit must obtain a special Clipper card that's only issued by AC Transit. The special card requires the youth to have their photo taken by AC Transit staff and put on the card. For youth without the special AC Transit endorsed Clipper card, the passenger did not have the option to purchase a 31-day pass on their card, but was still eligible to pay the youth single-ride fare with e-cash. For youth needing the specialized card, this was a frustrating process for them. No other transit agency required youth card applicants to go through the additional hoops, and that caused massive delays for AC Transit, upset parents who could not get the cards in time for the school year, and youth forced to pay cash fare and spend more money than the price of a pass. Also, for any youth cardholder that lost their card, the card can only be re-issued by AC Transit, unlike the various and easier methods to obtain a replacement for non-AC Transit youth card users. It's a great step to streamlining the process, but the question I want to ask AC Transit is: Why did you create a policy to put a photo on each youth card? 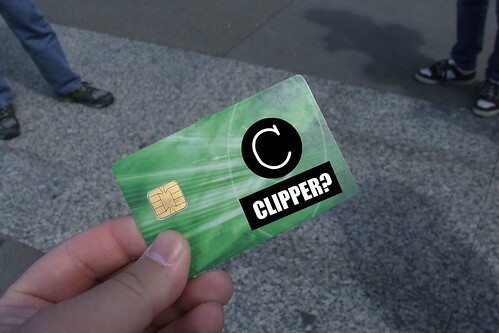 They knew the Clipper card program will be reaching millions of Bay Area citizens and the number of applicants was going to explode when the 31-day youth mag stripe pass was to be eliminated and only be sold on Clipper cards, and other transit agencies don't take a photograph at all. What was really the point? Prevent parents from stealing the card and riding the buses for cheap? Like the bus drivers even care to look at one's card or ask questions. They hear the single beep, and all is well. The possibility of card abuse is real. But by not streamlining the youth card applicant process that's universal with other transit agencies, it definitely outweighs the number of adults abusing the youth card's special privileges. So I've been a loyal Clipper user for years an consider myself to be fairly "in the know" about the system (e.g. I even read your blog regularly!). And today, after years of successful use, I finally managed to get hit by the dreaded Clipper Autoload diaster! My credit card was briefly suspended because its issuer suspected fraud (they were mistaken). I got this resolved, but not before the Clipper fairies tried to top off my card. The result: a confusing email which provides no information on how to resolve the problem, and I'm now locked out of my Clipper card for up to five days. Do they care that I have over $25 in my cash account, enough to probably last me through the week? Nope. Why does my credit card being declined once mean that I can't use the cash value I've already paid for? The frustrating thing is that I knew all about this issue, thanks to bloggers like you, and still made the choice to use Autoload because its convenient (I don't have to think about it) and my credit card works the vast majority of the time. I knew how stupid it was, but it just doesn't hit you until it happens to you. Of course, the MTC seems to view anything related to the operation of the Clipper system as not their problem (see also Cubic's insane fee for transit benefit recipients) rather than supervising their contractors and putting riders first.